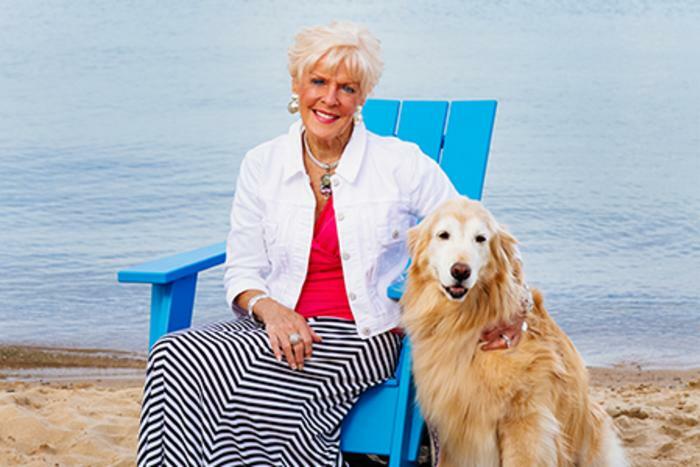 Tell us a little about what an Operations Manager does at Traverse City Tourism. I’m responsible for the day-to-day physical operations of the Traverse City Tourism office and the direction, coordination and overall management of numerous office and building operations, personnel/organization insurance plans and contracts, equipment, and procedures -- all to assure a smooth flow of work and information. I grew up in Traverse City, and throughout high school I helped my parents manage our small neighborhood grocery store. For many years I was fortunate enough to be a stay-at-home mom and “support system” for my husband and our three children. I also worked as an office manager assistant for a wholesale food company in Traverse City and as office manager of a finance company in Grand Rapids and Kalamazoo. I love working side-by-side with a great team of coworkers and the camaraderie we have formed over the years. I love the variety of responsibilities of my job, which can change on any given day, and how I sometimes have to find solutions for unexpected problems. I also enjoy interacting with our member partners and assisting them, and connecting with people from near and far who want to learn about our area or tell me about a memorable experience they had when visiting us in the past. The choices are endless! A few that immediately come to mind are dune climb challenges with my family at Sleeping Bear Dunes, art fairs, concerts at the Interlochen Center for the Arts, perusing the shops downtown, in the Village at Grand Traverse Commons or Leland’s Fishtown, holding family miniature golf tournaments at Pirate’s Cove – or simply taking my golden retriever on a long walk on one of our beautiful beaches. As for restaurants, my family loves to “grill out,” but when we do decide to have someone else cook for us, several of our choices are Old Mission Tavern, Red Ginger, The Little Fleet, Apache Trout & Grill and Amical. Sometimes, we’ll pick a restaurant we’ve never been to! I often meet friends or family at Minervas for their cranberry pecan spinach salad with grilled chicken or North Peak, where I love the caesar salad with blackened salmon (I especially enjoy eating on their outdoor deck) and I’m fond of Amical’s jumbo lump crab cakes appetizer -- and their outdoor patio. I also enjoy the Green House Café for their variety of soup selections. All in all, wherever we eat, it is an experience of awesome homemade food, excellent service, a warm atmosphere and ongoing conversations. Traverse City is a delightfully charming town with never-ending surprises for visitors of all ages! It’s truly a four-season destination, with beautiful freshwater beaches, year-round recreation, art, food and music festivals, shops and galleries, fabulous restaurants, wonderful theater, and so much more. Once people experience this amazing region, it isn’t long before they realize they have discovered an exceptional year-round getaway. My perfect day would be when my children are visiting for their summer vacation. 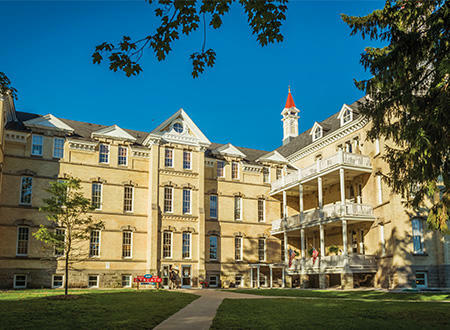 We’d begin by taking the dogs on a morning run/walk around the grounds of the Grand Traverse Commons, then make our way downtown and order takeout at Brew so we can enjoy an outdoor breakfast at the Open Space. After completing a “gentle” jog along the West Bay beach, we’d head home, shower, and load the car back up with beach necessities, a good book, etc. Our destination? 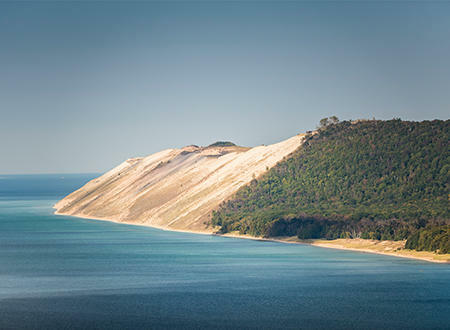 Either Van’s Beach near Leland for a day of relaxation, swimming the dogs and having lunch in Fishtown or the Sleeping Bear Dunes to do some climbing, walk a trail and spend the day on the Lake Michigan shoreline. As we head for home, we’d map out a plan for a walk and dinner downtown, and finally, a beach bonfire with s’mores as we wait for a mesmerizing sunset and the sky to be overtaken by a multitude of diamond-like stars. While we have some notable celebrities throughout the area, I would love “spotting” the Fox News Team of Elisabeth Hasselbeck, Steve Doocy and Brian Kilmeade; talk show hosts Kelly Ripa and Michael Strahan; dog whisperer Cesar Millan AND, of course, Kevin Costner or Chris Hemsworth would also be a great sighting. Since each season has its own unique attributes and exceptional beauty, I truly enjoy them all. Having said that, I’ll add that fall is currently my favorite season. I love autumn’s spectacular reds, golds, and oranges mixed in with a hint of green, and hearing the crunch of dry leaves under my feet. I love warm, sunny days and crisp, clear nights, football season (Go Green! ), corn on the cob, squash, an amazing choice of apples, pumpkin (ANYTHING!) and so much more. 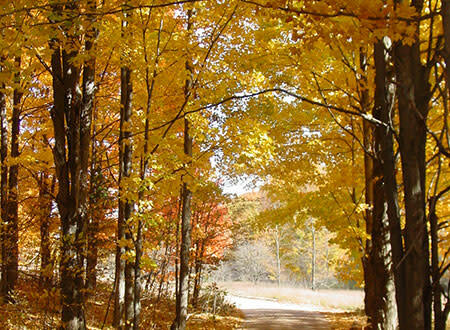 I’m looking forward to experiencing the fresh produce at our local farm markets, taking beautiful “leaf peeking” drives and walking my golden retriever on the TART trail, the grounds of the Commons or the Lake Michigan/West Bay shoreline. One of my favorite memories is when my son and daughter first experienced the Aurora Borealis that brightens our night skies. When the weather forecaster predicted an awesome night for viewing the Northern Lights, it became my husband’s mission to make sure our older children (then 11 and eight) could see them -- no matter when they appeared. Those dancing curtains of colored light were breathtaking and astonishingly beautiful. Our son and daughter were full of questions, excited by the fact that they were up in the middle of the night and totally captivated by the “lights in heaven,” as they dubbed them. (And yes, they were also the hit of their class at school the next day! Mission accomplished).